The bone forming the upper arm is the humerus. The humerus articulates with the scapula at the shoulder and with the radius and ulna at the elbow. The humerus is typically described as having a proximal region, shaft, and distal region. Both the anatomical and surgical neck of the humerus are highly susceptible to fracture. 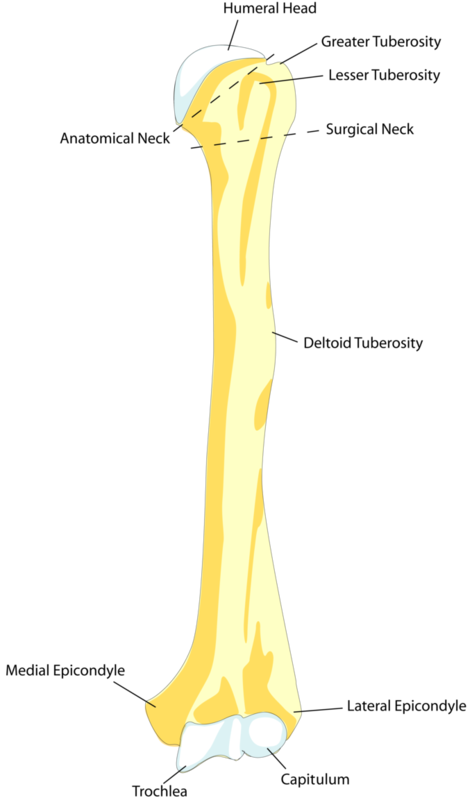 humerus: The bone of the upper arm. surgical neck: A constriction below the tubercles of the greater tubercle and lesser tubercle. capitulum: At the distal head of the humerus, it articulates with the radius of the forearm. trochlea: At the distal head of the humerus, it articulates with the ulna of the forearm. anatomical neck: A constriction adjacent to the humeral head that increases the range of movement possible at the shoulder joint. The humerus is a bone in the upper arm. It runs from the shoulder to the elbow. Proximally it articulates with the scapula to form the shoulder joint, or glenohumeral joint. Distally, the humerus articulates with the radius and ulna to form the elbow joint. Humerus: The humerus attaches proximally to the scapula (shoulderblade) at the humeral head and distally with the radius and ulna (lower-arm bones) at the trochlea and capitulum, respectively. The proximal portion of the humerus can be divided into three parts. The rounded humeral head projects medially and articulates with the glenoid cavity of the scapula. Immediately adjacent to the head is the narrower anatomical neck, which allows for a wider range of movements of the head within the shoulder joint. Finally, the greater and lesser tubercles are found at the most superior end of the main shaft of the humerus. The four rotator cuff muscles attach to these tubercles, strengthening and maintaining the shoulder joint. Between the two tubercles lies a deep grove called the intertubercular sulcus, through which the tendon of the long head of the biceps brachii runs. Below this proximal region lies the shaft, which is separated from the proximal region by the surgical neck, so termed as this in an area of frequent fracture. A major feature of the shaft is the deltoid tuberosity located laterally to which the deltoid muscle attaches. The deltoid, corocobrachialis, brachialis, and brachioradialis muscles attach to the anterior surface, with the triceps brachii attaching to the posterior. Distally, the humerus flattens to articulate with the ulna and radius at the elbow joint. The medially located trochlea articulates with the ulna. Located laterally to this is the capitulum that articulates with the radius. Several muscles of the forearm responsible for extension at the wrist attach to the humerus immediately above the capitulum and trochlea.